If you tune into BBC One on Sunday evening you may see a couple of familiar faces among the crowds of the Antiques Roadshow when it visited Kirby Hall in June. 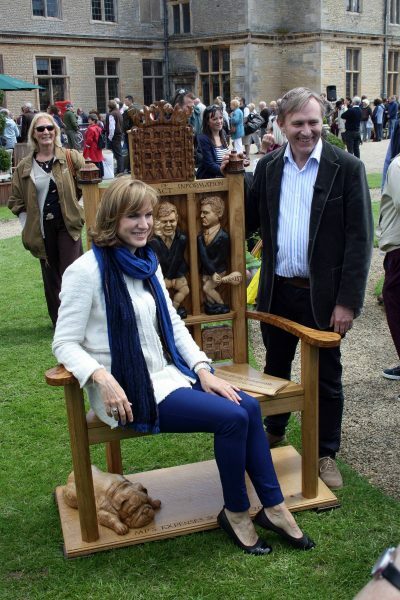 Appearing alongside presenter Fiona Bruce will be our resident woodcarver Glyn Mould, who caught the show’s attention with his carved wooden chair depicting the 2009 MPs’ expenses scandal. The chair, which took four months and 500 hours to carve, shows the then top three Westminster political party leaders David Cameron, Gordon Brown and Nick Clegg, caught with their trousers down over the scandal which resulted in them being dubbed the Rotten Parliament by the media. Glyn said: “I finished the chair in 2013. It’s a political seat to mark my 30 years in business and also to inspire students I teach about woodcarving. Glyn, who teaches his woodcarving courses at Sacrewell, initially contacted the Antiques Roadshow about an 1880s toolbox, but when the producers paid him a visit they asked him to bring the chair along too. It was valued at thousands of pounds, but if you want to know the total you’ll have to tune into the Antiques Roadshow at 8pm. And if that wasn’t enough to persuade you to watch, you might even see our retail manager Clive in the background.